August | 2015 | Let Teddy Win! Calvin Coolidge’s pet raccoon Rebecca made her first appearance at Nationals Park Thursday by disrupting the fourth inning presidents race and helping Calvin to victory. 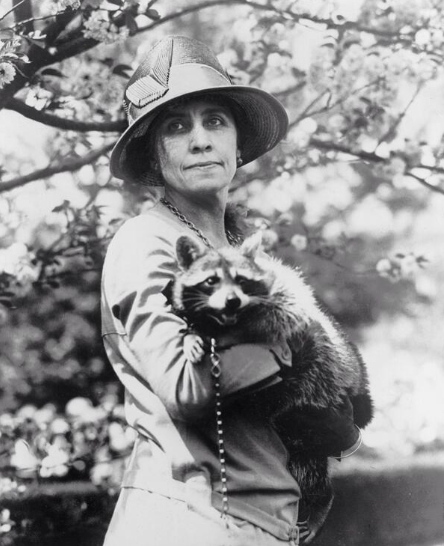 The raccoon was adopted as a pet by first lady Grace Coolidge in 1926, after she saved the raccoon from being served for Thanksgiving dinner. If tweets by Teddy are any indication, this isn’t the last we’ve seen of Rebecca. 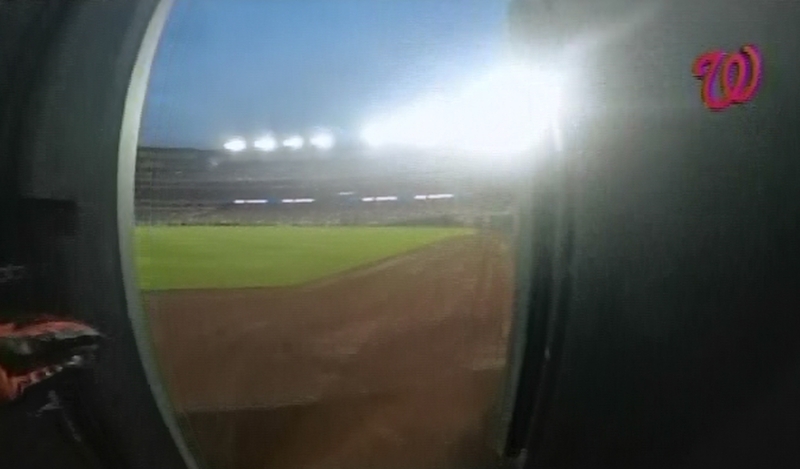 The raccoon’s appearance came just one night after another recurring interloper disrupted Wednesday’s presidents race. 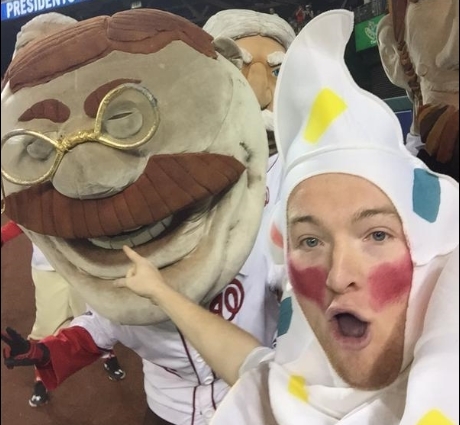 That race featured the return of Mr. Nice Cream Cone, who promoted his local ice cream shop by stopping each of the presidents in the middle of the race and snapping selfies to share on social media. The ice cream man then videotaped the rest of the race. Videos below include two from Thursday’s race, followed by Mr. Nice Cream Cone’s video and the race as seen on Nats HD. The gnomes are back, and shield your eyes, because it’s not pretty. It was one year ago this month that the Nationals started a fan frenzy by introducing the Jayson Werth Garden Gnome. 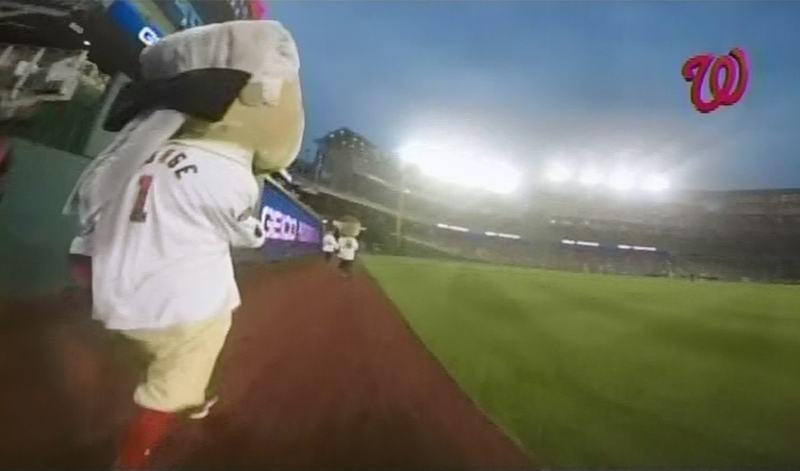 That night, the a life-size gnome clobbered the racing presidents with a single swing. 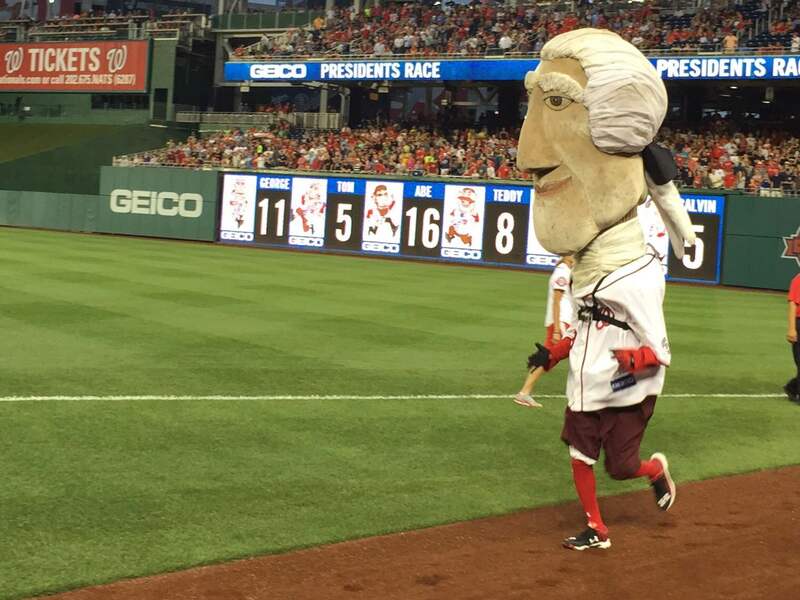 On Tuesday, gnome fever returned to Nationals Park with Anthony Rendon Garden Gnome night; and sure enough, when it came time for the fourth inning presidents race, a life-size Rendon gnome was waiting in the wings, giant bat in hand. But the gnome was not alone. As the race began, the original life-size Jayson Werth gnome took a position along the first base line, and a new life-size Rendon gnome positioned himself just downfield. 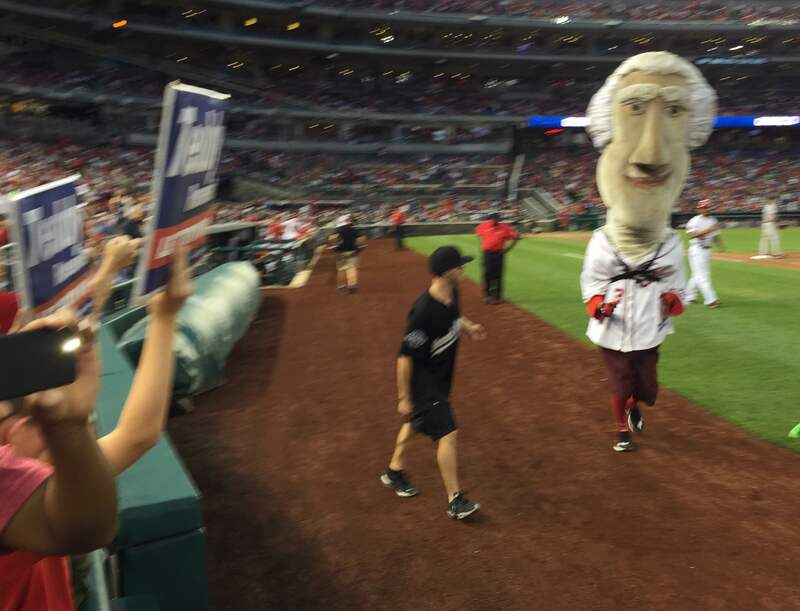 As the presidents entered the home stretch, they cautiously approached the bruising tandem, not wanting to repeat last year’s debacle; but as Abe Lincoln tiptoed around the Werth gnome, the Rendon gnome sprang to life and clobbered the Great Emancipator. Teddy Roosevelt was next. 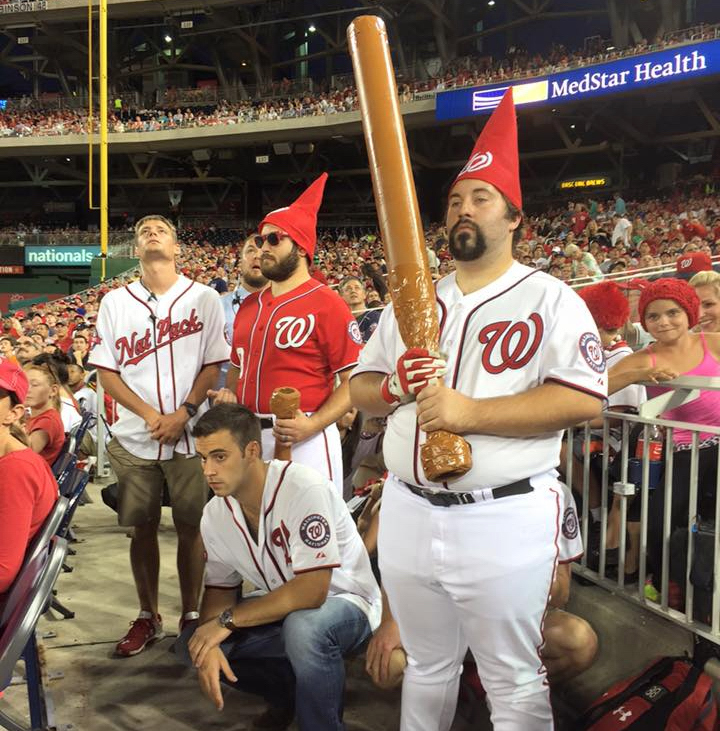 The Werth gnome sprang to life, swinging at Teddy, knocking the Bull Moose to the ground. 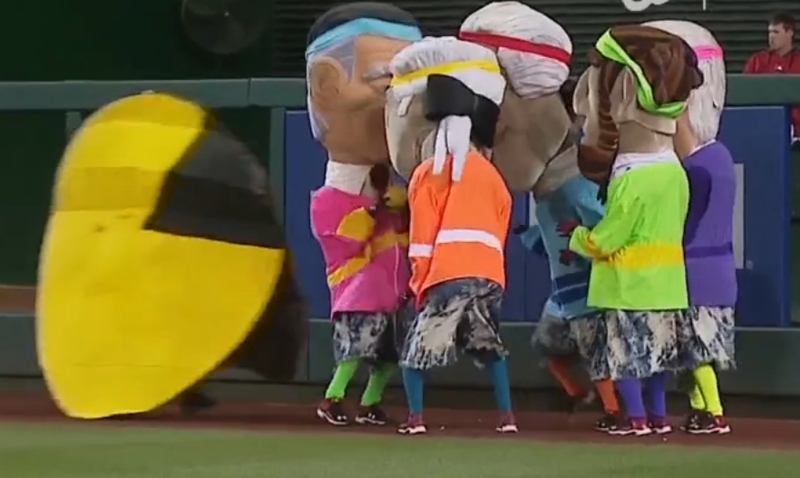 George Washington followed, and the Werth gnome knocked him out with a second swing that caused a chain reaction presidential pile up. 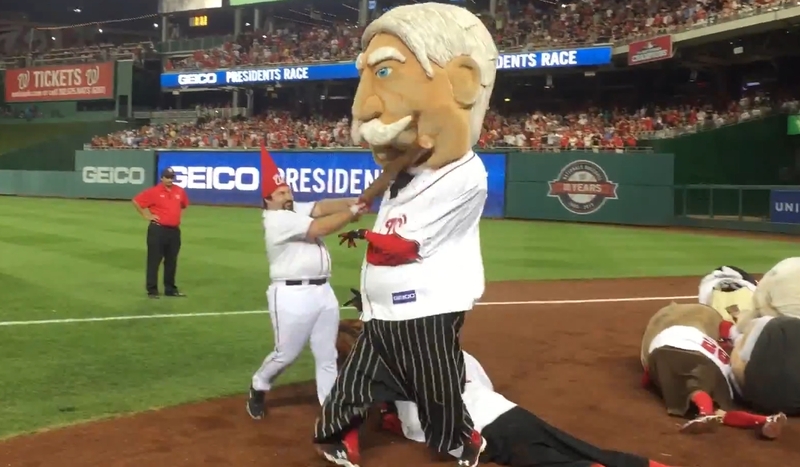 That left William Howard Taft as the only president on his feet, but the Rendon gnome clotheslined the Chief Justice to knock out the last of the competitors. Washington recovered to his feet and ran wide to take the win. Taft tweeted this brief clip. Full finish line video below. Saturday night’s presidents race brought the sort of complicated story line that leaves many in the Nationals Park stands scratching their heads. But that’s why we’re here. As all good presidential historians know, Saturday marked the 113th anniversary of the day Teddy Roosevelt became the first president to make a public appearance in an automobile. Accordingly, the Bull Moose made a grand entrance for the fourth inning race, standing aboard a motorcade and waving to the crowd as the other presidents jogged behind. 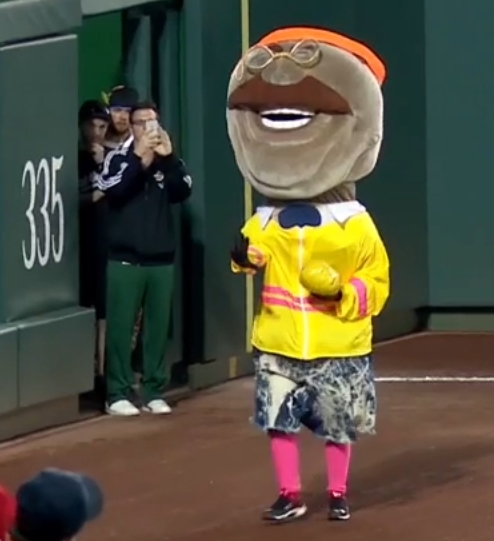 But alas for Teddy, a trap had been set by none other than Martha Washington, who played the damsel in distress by her scooter, which had apparently broken down in the middle of the warning track. The roadblock stopped the motorcade, as as the other presidents all bent over to help, Martha and husband George took off for the finish line. 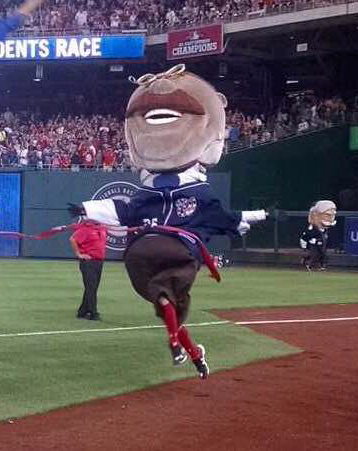 The Nationals racing presidents returned to DC in style Friday night, kicking off the Nats’ latest homestand by dancing to Silentó’s Watch Me (Whip/Nae Nae) during the fourth inning presidents race. The race began with Washington, Jefferson, Lincoln, Taft and Coolidge emerging from the usual starting gate, but Teddy Roosevelt emerged from the bullpen carrying a boom box and stopped the race on the right field warning track. 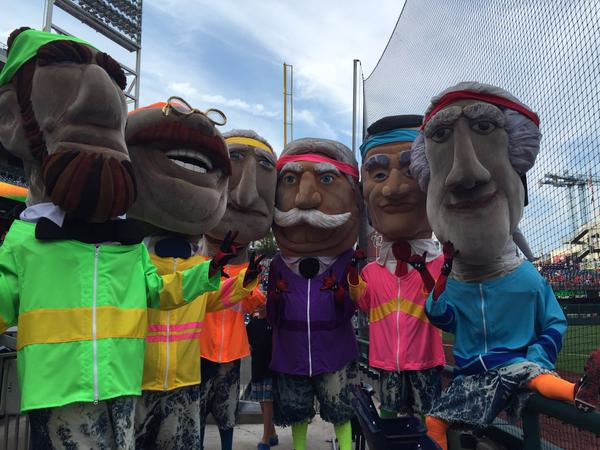 The presidents then did the whip and the nae nae, drawing cheers from the Nationals Park crowd; but with his competitors distracted, Teddy then bolted for the finish line. 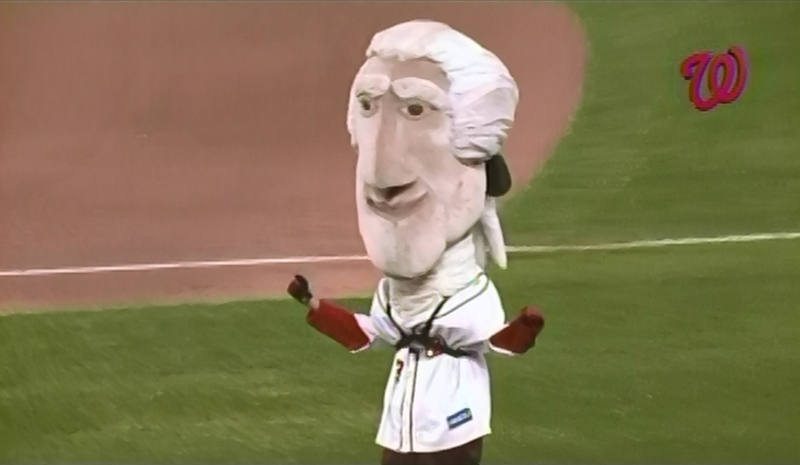 Ever wonder what it’s like to be in the Nationals’ presidents race? 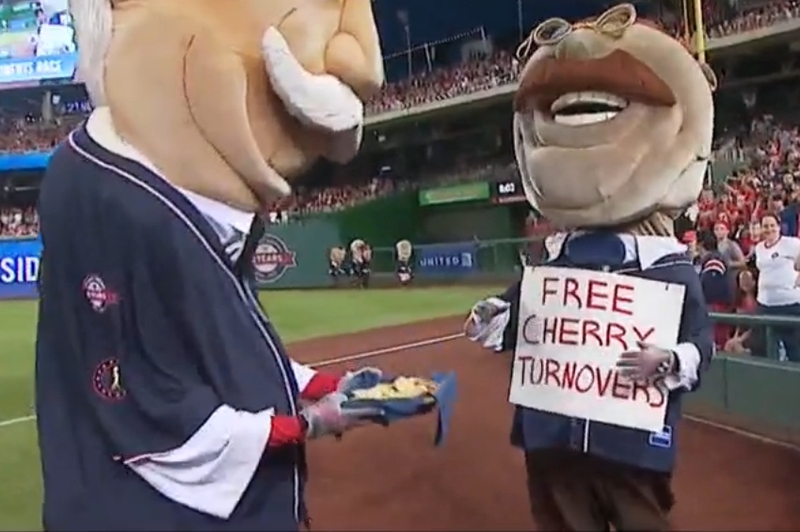 After donning the Thomas Jefferson costume Friday night in response to a challenge by Nats’ manager Matt Williams, MASN sideline reporter Dan Kolko has created the best insider chronicle yet of the true racing president experience. The segment aired on Saturday’s Nats Xtra pregame show, and featured GoPro camera footage coupled with the first “mic’d up” audio in racing president history. 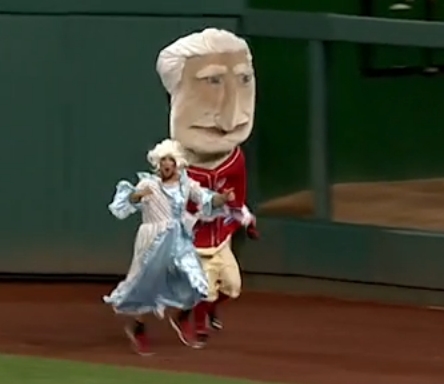 Weighing 40 to 50 pounds each and towering over 4 feet above the racer’s head, the Nats’ presidents costumes don’t make running very easy, and Jefferson’s costume is both the tallest and heaviest of the bunch. “They were kind of putting me to the test a little bit,” Kolko said, “and I think we can all say that I failed.” Kolko finished eleven seconds behind the pack. The outstanding segment is below. See Friday night’s report for more photos and video from the finish line.